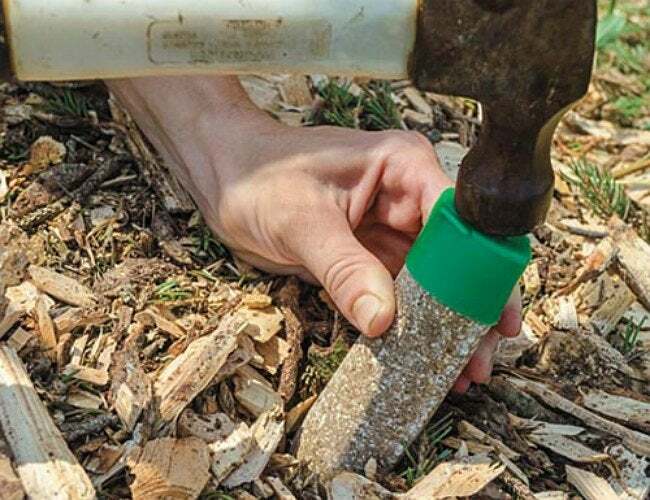 Compared to other, more demanding fertilizer applications, fertilizer spikes offer a quick and easy, no-hassle method of providing trees and shrubs with the nutrients they need to thrive. Here's what you need to know. Looking to give your trees and shrubs a nutritional boost? If so, consider fertilizer spikes. Filled with vital nutrients, these solid, spike-shaped plugs are hammered into the ground, supplying gradual-release feeding for up to several months. You’ll find many different fertilizer spikes on the shelves of your local home center. While some are general purpose, others are formulated to benefit a specific variety, be it fruit trees, deciduous trees, evergreens, palms or even vegetables. It’s usually best to place fertilizer spikes when the ground is moist and soft, typically during spring and fall. In colder weather, when the soil is dry and hard, water the ground thoroughly to make the going a little easier. Note that fertilizer spikes come with a special plastic cap. Place the cap over the top of a spike to make sure that it remains intact as you hammer it into the ground, usually to a point just below the surface. Generally speaking, fertilizer spikes are positioned in a circle around the tree or shrub, at a remove of several feet from its trunk or main stems, respectively. For instructions specific to your chosen fertilizer spikes, see their packaging or included manual.